The SP20R is 20-W photovoltaic power source capable of recharging batteries. It has an on-board voltage regulator, and a 6.1 m (20 ft) cable with stripped and tinned leads that connect directly to a user-supplied deep-cycle battery. The SP20R is often used for system configurations that have higher-than-average power requirements, or in higher elevation and latitude locations. It allows unattended operation of systems in remote locations, far from AC electrical sources. Liefert Strom wo kein Anschluss vorhanden oder zu teuer oder unzuverlässig ist. The SP20R includes mounting hardware consisting of the the pn 17492 U-bolt and Matching Nuts. The pn 17492 U-bolt provides a 2.125" (5.398 cm) space between the U-bolt legs. This hardware allows the solar panel to be mounted to a 0.75" to 1.5" IPS pipe (1" to 2" OD). Please note that the SP20R has a 2-mA continuous current drain (meaning that it consumes a small amount of power from the connected battery at night). 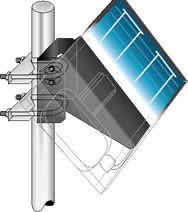 Note: The wind ratings are for solar panels with the indicated mounts and do not account for strength of tower or tripod. The solar panel includes an onboard regulator. The SP20R-L is compatible with user-supplied, flooded 12 Vdc batteries, such as deep-cycle marine or RV batteries. Flooded batteries should be charged with the 18529 MorningStar SunSaver regulator or the SP20R. The SP20R draws a continuous 2 mA current drain. The 18529 MorningStar SunSaver draws a continuous 8 mA current drain.